Rangers, now without a win in 14 games, started the day seven points clear of their relegation play-off rivals. But Rovers, boosted by the unexpected award of three points from the Scottish Football League, after Clyde fielded an unregistered player against them, won only their second game of the season when they won 1-0 away to Stirling Albion. This meant Berwick’s point for their 1-1 draw against Cowdenbeath saw the deficit cut to only two points. 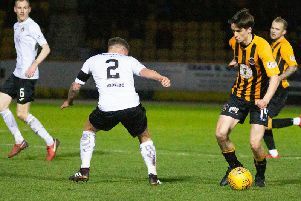 Calum Adamson netted his third goal in four games when he gave Rangers a 24th-minute lead. 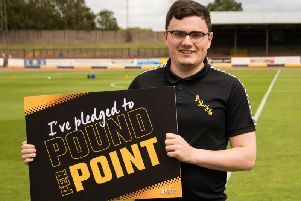 But, just seven minutes later, the visitors drew level when Robert Buchanan forced the ball home from close range following a cross on the right from David Cox. Then, late in the game, substitute Declan O’Kane was sent off for a high foot. His dismissal in the 90th minute had no effect on the game, but afterwards, manager Harvey said the sending off seemed a little harsh. “The player came in behind Declan, who didn’t know he was there,” he said. “His foot was high, it was a foul, maybe even a booking. But I didn’t think it was a sending off. “We have two big games coming up at home this week (against Queen’s Park on Tuesday and Peterhead on Saturday) and losing Dougie and Declan is a blow.